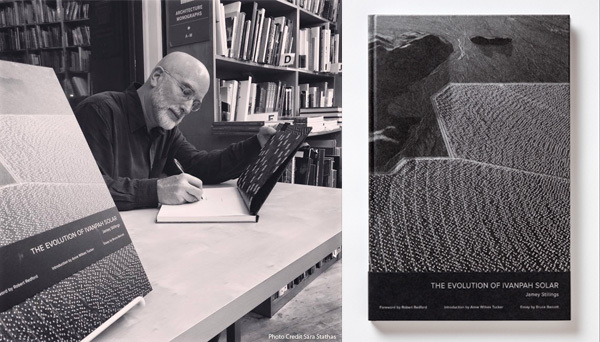 Congratulations to photographer Jamey Stillings on his newly released monograph, The Evolution of Ivanpah Solar, published by Steidl. The book reproduces 60 of Stillings’ black-and-white images, along with contributions from Bruce Barcott, Robert Redford and Anne Wilkes Tucker. The timeliness of this project is reinforced with the current worldwide focus on climate and alternative energy. At the COP21 Paris Summit this week, 196 countries will meet to sign a new climate change agreement. Stillings’ bookcover photograph, #9499, 21 March 2013, is included in the official UN Climate Change Legacy Exhibition. The decisive role of renewable energy in achieving global climate goals is undisputed. But what does renewable energy look like? Jamey Stillings took photographs of the world’s largest concentrated solar power plant, Ivanpah Solar, in the Mojave Desert, California. Here 300,000 mirrors (each the size of a garage door) focus the sun’s rays onto solar towers across 14 square kilometers of public land. Stilling’s aerial photographs record the transformation of nature into precise geometric forms. These are unsettlingly beautiful images of human activity in an unforgiving landscape. Join Stillings in Santa Fe at photo-eye Bookstore/ Project Space on Saturday December 5th from 3–5pm for a booksigning.